Not every boat search on BoatTrader.com is brand-specific. In fact, of the 8.7 million searches conducted in the first four months of 2012, they were in the minority. However, we always find it instructive to see which brands our visitors are seeking out, and one thing does not seem to change. Sea Ray always ranks at the top, and it once again claims its crown as the undisputed heavyweight champion of the boating brand universe. To date this year, searches for Sea Ray boats have been more than double those of the next contender. 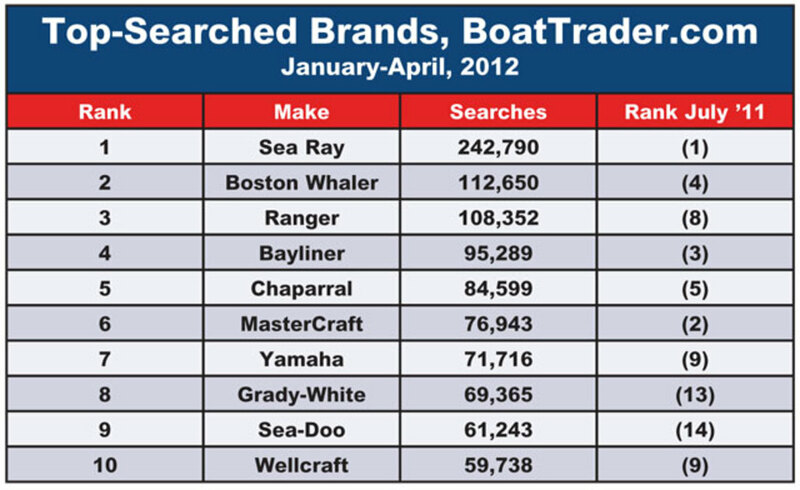 Boston Whaler and Ranger ran neck-and-neck for second and third through April, with Bayliner not far behind. Rounding out the top five was Chaparral, which appears to have solidified its ranking from a couple of years ago, when it was often further down in the top 10. The other brand that has made good strides in recent years is Yamaha, which moved into the top 10 last year from a position near the lower end of the top 20 and has continued to gain strength. Seasonality is a factor in brand searches and short-term shifts in position are normal. This year, as in other years, we see that fishing-boat brands, such as Ranger and Grady-White, often rank best early in the season. Towboats, such as MasterCraft, typically climb much higher in the warmest months.